When a filly is born, it is always a cause for celebration, but the arrival of Kareemah Albidayer was particularly auspicious. Bred and owned by Sheikh Mohammed bin Saud Al Qasimi at his Alibidayer Stud, located in Sharjah in the United Arab Emirates, Kareemah Albidayer has already lived up to expectations. Kareemah Albidayer is sired by Albidayer Stud’s homebred superstar stallion, Kanz Albidayer sired by Ajman Monisicone (WH Justice x Anthea Monisicone) and out of Albidayer Stud’s DL Marielle (Marwan Al Shaqab x RGA Kouress). The full sister to Albidayer Stud’s senior stallion Marajj, the current US National Champion Stallion, DL Marielle’s greatest gift to the stud was, perhaps, Kanz Albidayer. Foaled in 2009, Kanz Albidayer was a star from the moment he was born, taking the unanimous Gold Junior Champion Colt title at the UAE Bred Show when just six months of age. A plethora of wins and titles across the Middle East and Europe, culminating in his second Dubai International Arabian Horse Show Gold Champion Colt title – no small feat for a colt not yet three years of age. Since then, Kanz Albidayer has more than made a name for himself as a sire, as Kareemah Albidayer proves. Kareemah Albidayer. Credit Osteen Schatzberg. Kareemah Albidayer’s dam is also very special to all at Albidayer Stud, being the 2003 mare, Khaleifa, a wonderful combination of some of the best Russian and Egyptian bloodlines in the world. Khaleifa is sired by the late Kubinec (ex Kosmetika by Muscat), a son of the famed Balaton (Menes x Panagia), perhaps the last great stallion to have been bred at the Tersk Stud in Russia and one whose trot was legendary. To Khaleifa’s damline, we have the lovely Farid’s Mandolin, a daughter of Anaza El Farid (Ruminaja Ali x Bint Deenaa) and out of Madrigall (The Minstril x Esprit D Asadd), making Khaleifa double Ruminaja Ali (Shaikh Al Badi x Bint Magidaa) though her damline. Bred in the United States, where Khaleifa resides, Kareemah Albidayer was foaled in 2016. From the moment she arrived, all knew that she was special. She inherited her sire’s incredible face and attitude, something that he passes on to each foal, and then added more attitude from her dam, a huge-moving mare and much admired by all that see her. With her chiselled face, her large, expressive eyes, good limbs, and natural show presence, Kareemah Albidayer caught the eye of everyone who saw her. 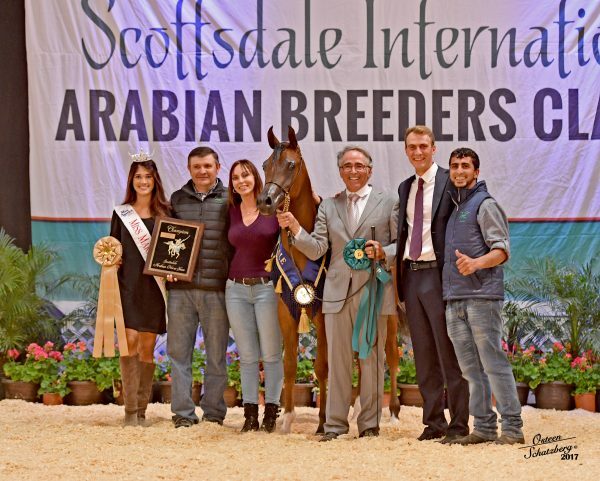 Kareemah Albidayer made her showing debut earlier this year when she competed at the Scottsdale All-Arabian Horse Show in February. Entering the international classes, this young bay beauty won her class with ease, and then took the Gold International Yearling Filly Championship in style. 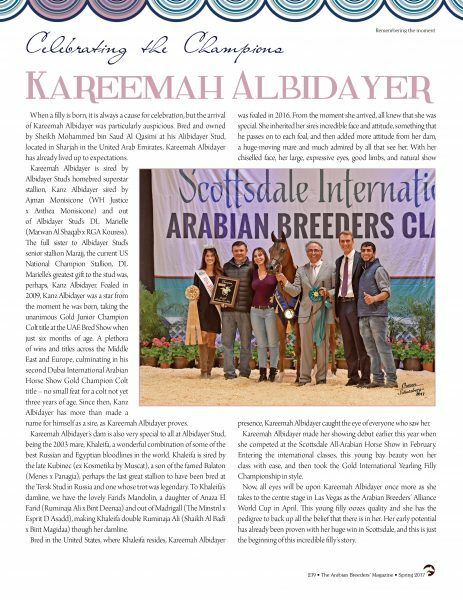 Now, all eyes will be upon Kareemah Albidayer once more as she takes to the centre stage in Las Vegas as the Arabian Breeders’ Alliance World Cup in April. This young filly oozes quality and she has the pedigree to back up all the belief that there is in her. Her early potential has already been proven with her huge win in Scottsdale, and this is just the beginning of this incredible filly’s story.